This evening we are looking at the Athanasian Creed. 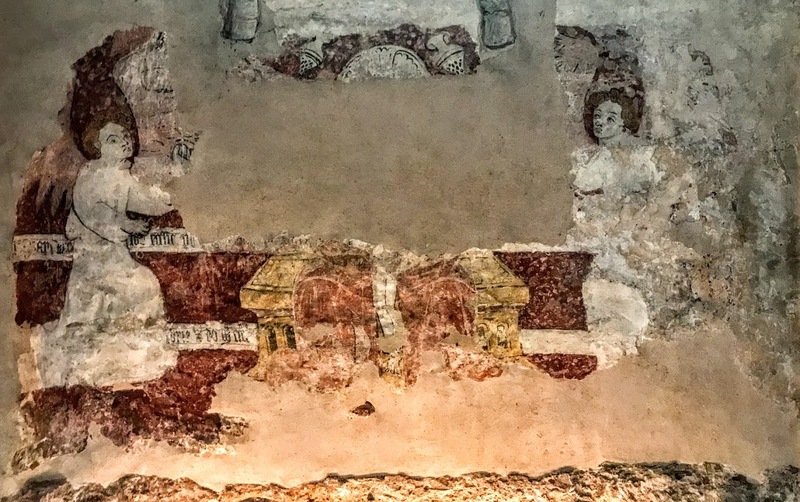 Although it is not found in the New Testament, Anglicans have always accepted it as one of the ‘Ecumenical Creeds,’ alongside the Apostles’ Creed and the Nicene Creed. So, this evening we are looking the Athanasian Creed, its origins, how we use it, asking how it differs from the other Creeds, looking at its strengths and its weaknesses, and looking at how it is used. But, while we call these three creeds ‘ecumenical,’ in reality there is only one ecumenical creed, the Nicene Creed. Incomprehensible? Nothing to do with daily life and reality? Are these some of the difficulties you could imagine when it comes to thinking and talking about the Trinity? This creed has been used since the sixth century. It is the first creed in which the equality of the three persons of the Trinity is explicitly stated. It differs from the Nicene-Constantinopolitan Creed and Apostles’ Creed in the inclusion of anathemas, or condemnations of those who disagree with the creed. The Athanasian Creed was designed to distinguish Nicene Christianity from the heresy of Arianism. 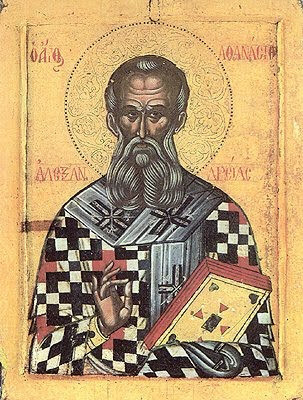 A medieval account says Athanasius of Alexandria, the famous defender of Nicene theology, as the author of the Creed. According to this account, Athanasius composed it during his exile in Rome and presented it to Pope Julius I as a witness to his orthodoxy. The theology of the creed is firmly rooted in the Augustinian tradition, using exact terminology found in Augustine’s On the Trinity (415). The Athanasian Creed was used in a sermon by Caesarius of Arles, and resembles the works by Vincent of Lérins, indicating it may have been written in southern Gaul, perhaps in the late fifth or early sixth century AD, at least 100 years after Saint Athanasius. The oldest surviving manuscripts of the Athanasian Creed date from the late eighth century. Today, church historians accept that the creed was not written by Athanasius, that it was not originally called a creed at all, nor was the name of Athanasius originally attached to it. It was probably written originally in Latin, while Saint Athanasius wrote in Greek. Neither Athanasius nor his contemporaries ever mention the Creed. It is not mentioned in any records of the ecumenical councils. It appears to address theological debates that developed after Saint Athanasius died in Alexandria in 373, including the place of the filioque in the Creed. Its statements on the procession of the Holy Spirit from both the Father and the Son could not be accepted in any Orthodox tradition. It was widely circulated among Western Christians, but was not used in the East. I remember a time when the Athanasian Creed was used on Trinity Sunday in parishes in the Church of Ireland and the Church of England. But in recent years, this Creed has been relegated to a place in the Book of Common Prayer of the Church of Ireland between the Catechism and the Preamble to the Constitution. It is in a difficult place to find, between pages 771 and 773, and there are no directions about when or where it might be used. So how do we explain the Holy Trinity, a key understanding of God, in a world that today finds it difficult to wrestle with deep and often abstract philosophical concepts? How do we explain, or even introduce, the topic of the Trinity in a way that people can understand without being boring? The Athanasian Creed is not the most popular of creeds nowadays, nor is it the easiest to understand. The Athanasian Creed is composed of 44 rhythmic lines, appears to have been intended as a liturgical document – that is, the original purpose of the creed was to be spoken or sung as a part of worship. The creed itself uses the language of public worship, speaking of the worship of God rather than the language of belief (‘Now this is the catholic faith: We worship one God’). The Athanasian Creed is usually divided into two sections: lines 1-28 addressing the doctrine of the Trinity, and lines 29-44 addressing the doctrine of Christology. Enumerating the three persons of the Trinity, the Father, the Son, and the Holy Spirit, the first section of the creed ascribes the divine attributes to each individually. So, each person of the Trinity is described as uncreated (increatus), limitless (immensus), eternal (æternus), and omnipotent (omnipotens). While ascribing the divine attributes and divinity to each person of the Trinity, and so avoiding subordinationism, the first half of the Athanasian Creed also stresses the unity of the three persons in the one Godhead, thus avoiding tritheism. Furthermore, although one God, the Father, Son, and Holy Spirit are distinct from each other. For the Father is neither made nor begotten; the Son is not made but is begotten from the Father; the Holy Spirit is neither made nor begotten but proceeds from the Father – Western churches include ‘and the Son’ (filioque), a concept which Eastern and Oriental Orthodox reject. The Christology of the second section is more detailed than that of the Nicene Creed, and reflects the teaching of the First Council of Ephesus (431) and the definition of the Council of Chalcedon (451). The Athanasian Creed uses the term substantia (a Latin translation of the Nicene homoousios: ‘same being’ or ‘consubstantial’) not only with respect to the relation of the Son to the Father according to his divine nature, but also says the Son is substantia of his mother, the Virgin Mary, according to his human nature. The Athanasian Creed is widely accepted among Churches in the West, including the Roman Catholic Church and some Anglican churches and Lutheran churches, where it is considered part of Lutheran confessions in the Book of Concord. The Athanasian Creed has never gained acceptance in the Orthodox Church, where it is seen as an unorthodox fabrication that contains the filioque clause. In the mediaeval Church, this creed was recited following the Sunday sermon or at the Sunday Office of Prime. The creed was often set to music and used in the place of a Psalm. In successive editions of the Book of Common Prayer from 1549 to 1662, its recitation was provided for on 19 occasions each year, a practice that continued until the 19th century, when vigorous controversy regarding its statement about ‘eternal damnation’ saw its use gradually decline. The Book of Common Prayer includes the Athanasian Creed (see pp 771-773), after the Catechism of 1878 and before the Preamble and the 39 Articles. But there are no rubrics about when and how it should be used. The Athanasian Creed is still included in The Book of Common Prayer of the Church of Ireland (see pp 771-773) but has been edited for inclusion by the Church of England in Common Worship as an ‘Authorized Affirmation of Faith’ (see p 145). Can you imagine situations or occasions on which you would use it? Can you ever remember it being used? Last year I took a photograph of a fresco on the wall of the south choir aisle in Lichfield Cathedral depicting the Holy Trinity. This scene, showing the Trinity flanked by two censing angels, was painted sometime between the 14th and mid-15th century. This painting was damaged severely by the Puritans in the religious strife later in the mid-17th century. But it is still possible to look closely and to see how it originally depicted the Holy Trinity..
As I look at it closely, I can just make out the representation of God the Father seated on a golden throne, clad in a red robe. He is holding his crucified Son, God the Son, Jesus Christ, before him. Originally, this fresco would have shown a full depiction of the Crucifixion. However, all that can be seen today are the legs of Christ, with his feet nailed to the Cross. God the Holy Spirit, traditionally depicted as a white dove, is now missing from this painting because of Puritan vandalism. 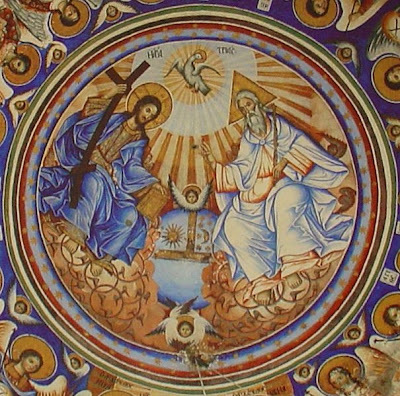 But originally the Holy Spirit was placed in this painting between the heads of God the Father and God the Son. What this fresco teaches me is that we can always catch glimpses of God. When we see the work of Christ, we see the work of God the Father, and so on. We may not always see how the Holy Spirit is working in us, or in others, but we still know that God is working in love in us and in others. And the best way we experience that is being open to the love of God and in loving others. The late Thomas Hopko (1939-2015), a renowned Orthodox theologian, has argued that if God were not Trinity, God could not have loved prior to creating other beings on whom to bestow God’s love … if God were not Trinity, God could not have loved prior to creating other beings on whom to bestow God’s love. This love or communion of God as Trinity is extended to us in the communion of the Church. It is not just the Trinitarian faith into which we are baptised, but also the love or fellowship of the Trinity. That just because someone doesn’t love you the way you want them to doesn’t mean that they don’t love you with all they have. That true friendship continues to grow even over the longest distance, same goes for true love. That either you control your attitude, or it controls you. That heroes are the people who do what has to be done, when it needs to be done, regardless of the consequences. That my best friend and I can do anything or nothing and still have the best time. That sometimes the people you expect to kick you when you are down will be the ones to help you get back up. That you shouldn’t be so eager to find out a secret, it may change your life forever. That the people you care about in life are taken from you much too soon. And I realised then that their teachers had taught them so much about the truth that lies behind everything we try to teach about why the doctrine of the Holy Trinity matters now more than ever in the Church. and another of the Holy Ghost. The Father eternal; the Son eternal: and the Holy Ghost eternal. and the Holy Ghost Almighty. So the Father is God; the Son is God: and the Holy Ghost is God. to say, there are three Gods, or three Lords. The Son is of the Father alone: not made, nor created; but begotten. the Unity in Trinity, and the Trinity in Unity is to be worshipped. He therefore that will be saved, let him thus think of the Trinity. descended into hell, rose again the third day from the dead. He ascended into heaven, he sitteth on the right hand of God the Father, God Almighty:  from whence he will come to judge the quick and the dead. and they that have done evil, into everlasting fire. which except a man believe faithfully, he cannot be saved. Next Week (11 April 2019): the 39 Articles.